Visual Inspirations can tell you from their 60 combined years of retail design and visual merchandising experience that Christmas simply isn’t festive for your customers if you don’t make an effort to create a retail Christmas display. It’s pivotal to your bottom line. If your competitor creates a great Christmas atmosphere and you have a lacklustre attempt, studies confirm that on almost every occasion customers will be drawn to spend at the festively decked-out store. Shoppers need to see your store in the Christmas mood. Once you make the effort, they open their hearts and wallets to a better shopping experience. So if it’s simply beyond you – in time or in conception – invite our Visual Inspirations design team in to help. They have the imagination and eye for detail that would put a giant smile on Santa’s grumpiest elf. Visual Inspirations specialises in small spaces. We conquer large ones too. We deal out the type of colour, inspiration and industry-leading Christmas displays that seem impossible. If you have limited space, then we recommend roof decorations and wall hangings to promote a festive feel with a fresh quality. The possibilities are endless with our design team as every store’s individuality gives our experts an idea different to the last. We know that a larger space, like a shopping centre’s atrium or food court clears the way for you to bring in ‘the big guy’ – Santa displays that are eye-catching and heart-warming. The props can vary from a simple throne to the red carpet, lush tree, reindeer props and a bevy of baubles. If you want us to just drop a prop and go, then we need to talk. We are passionate about visual displays. 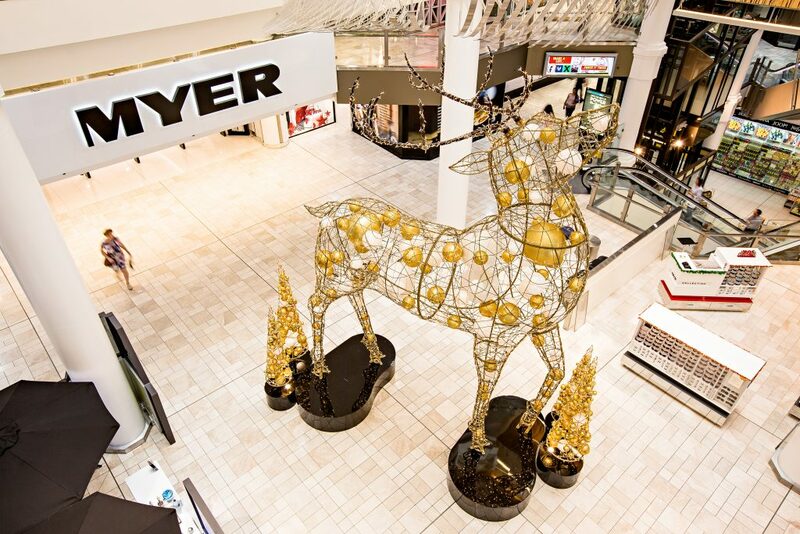 We lead Australia as a visual design company because we create exceptional and outstanding retail Christmas displays. Rather than just delivering items, we produce a Christmas theme that astounds and captivates. Challenge us with your brief, or let us come up with a new concept that will get everyone talking. Depending on your project, a custom retail Christmas display package could be the perfect choice. For a quicker installation, we have ready-to-use props to hire for Christmas events or displays. If you have an idea, we’re ready to listen, create, fascinate and entertain. If you still need some convincing, then contact us today for a time to see examples of our past successes. So yes, we’re about building that all important positive Christmas vibe for your customers. Visual Inspirations will build that expressive bridge to a visual wonder that people can’t help but be drawn to. Visual Inspirations are experts at conjuring the ‘feel good’ Christmas factor. We’re ready to stuff your stocking full of it. Give us a call on 08 9371 8618 or email us to get the bauble rolling.